When Lacey first spies Dylan, she likes his looks, but she loves his shirt. He’s wearing a vintage AFI shirt from the Black Sails in the Sunset album. She’s impressed with his vintage clothing, and they bond a bit over their love of the band, bantering lyrics from “Endlessly, She Said.” Those lyrics carry through to the end of the novel and provide insight into both Lacey and Dylan’s characters. Music even forms part of the connection she has with Thomas (her other love interest) and with her mother’s husband. It’s an important part of her life, so anybody who wants to love her has to understand that. What song/band is special to you? I was in high school ten years ago. I wasn’t sure about B.J. We stared at each other in an odd silence. The air should have crackled with tension. After all, I was pretty sure he was firing me, but the room did not grow heavy with the weight of my impending doom. I think we both found this development odd. If I had to pinpoint anything developing in the air between us, I’d to go with a different kind of friction. That unsettled feeling in my tummy returned, though it was not as acute as it had been earlier with Dylan. Based on the way B.J. looked at me and then away, I guessed he was experiencing the same malady. As we studied one another, I became aware of him as a man. I shifted and put some serious energy into resisting the urge to play with my hair or smile coyly. If we’d been in the coffee shop, I think he would’ve struck up a conversation culminating in a request for my phone number, and I would’ve given it to him. His tone was closer to “Hey, I like you. Want to grab coffee?” than “You’re about to lose your job.” I had no idea how to take that, so I ignored his tone and responded to the meaning behind his words. 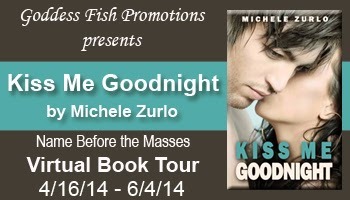 Michele will be awarding an autographed paperback of Kiss Me Goodnight and choice of T-shirt or travel mug to one randomly drawn Rafflecopter winner (US only). Thanks for having me at Illustrious Illusions today! Andra, That's such a great story--so sweet and romantic. Something similar happens with Lacey and Dylan in Kiss Me Goodnight, though it doesn't necessarily end how either of them expect/want it to! My first kiss was so long ago I don't remember it. He was my first boyfriend, I was fifteen. Rita, I don't remember my first kiss either. I think it had more to do with a lack of "wow" factor than age (lol). Elise-Maria, I know what you mean ; ) Sometimes people come into our lives that make us forget anything that came before. Those are the best memories. The guy I was on a blind date with (now my husband) ran through the rain to get his truck so I wouldn't have to. And when I climbed in and slid over he kissed me, and the rest they say is history! Thanks for the giveaway! You're welcome, Gina! Thanks for sharing your story. Blind dates have such a bad reputation, and you've redeemed them. Hi Karen, the memory is a tricky thing! I first kiss happened at the skating rink when I was 13 I think. If I'm remembering correctly, it was when I was in the 6th grade. My best friend, at the time, hinted that her brother should date me (in front of both of us, I might add) and then later he asked me to 'go steady'. And I believe the first kiss was during recess. And as usual, other kids started making fun of me in particular when it happened. I'd grown up being made fun of a lot but when my older sisters starting making fun of me for dating him (even making fun of him for his name, which was Terry), I broke up with him at the start of 7th grade. I've never been good at deal with that sort of thing. my first kiss was when I was about 5. My little boyfriend was moving to Florida with his family and we kissed and swore our undying love. My first kiss was when i was about 6 with my next door neighbour who was also 6, in my garden shed. After a normal kiss he then said "if you lick mine I'll lick yours!" I felt so guilty i told my mum about it!